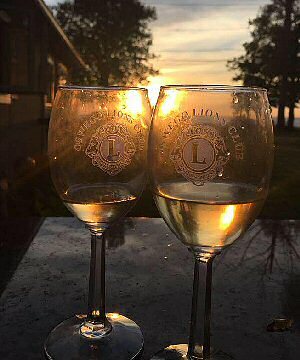 OSWEGO, NY – The Oswego Lions Club will hold its 21st annual Wine and Beer tasting with silent auction March 29 at the American Foundry in Oswego. Pre-sale tickets are available at Cakes Galore and More or from any Lions Club member. Each person will be provided a complimentary wine glass or beer mug at the door. The annual event will once again showcase many of the area’s finest beer vendors, Eagle Beverage and Onondaga Beverage. Country Pickin Hard Cider and Lock 1 Distilling Company will also attend this year. Many New York State wineries including Lakeland Winery, Thousand Islands Winery, Coyote Moon Vineyards and Collaca Estate Winery will also participate. Also taking part again this year is Taste the World, sampling coffees and their adult beverage mixers. The popular silent auction will include many donated items from businesses throughout the area. Some of the many great auction items include a cake a month for a year from Cakes Galore and More, gift certificate towards a car detailing from The Shine Shop, cooler filled with goodies from Fulton Savings Bank, Funny Bones passes, Minnie and Mickey Mouse figurines from M&B Ceramics, three-drawer oak dresser from Ray’s Furniture Perks, gift basket from Canale’s Restaurant, fruit and beer gift basket from C’s Farms Market, many gift certificates and much more. If businesses would like to donate a silent auction item there is still time; call Karen Hammond at 342-0043 or Bob Bateman at 342-9866. As we have for the past few years, there will be a live auction at the end of the event. This year we will be auctioning off a dinner for four at the high bidder’s home courtesy of Bill Wadsworth of 1-9-7 Bistro. The meal will include appetizers, dinner and dessert. Another featured item for our live auction will be a beautiful metal sculpture donated by Tim Desacia, and we will also auction off a wine cellar with wine refrigerator donated by the Oswego Lions Club. Complimentary appetizers will be provided and a cash bar will also will be available. Please feel free to contact Hammond at 342-0043 or Bateman at 342-9866 with any questions and or to purchase tickets. For additional information, please visit www.oswegolionsclub.org or Oswego Lions Club Facebook page at www.facebook.com/oswegolionsclub. All proceeds of the event will benefit The Oswego Lions Club and its active role within, and contributions to the community. Anyone interested in becoming a member or learning more about the Oswego Lions Club should contact any member of the Lions Club. Established in 1917, Lions International consists of 40,000 local Lions clubs worldwide with membership of 1.4 million volunteers. Local chapters of the club are committed to serving the disabled including those with eyesight, impairments, hearing loss and other handicaps. Beat those winter blues and come out and support your local Lions Club and check out all the great wines, beers, coffees and all the beautiful auction items. We are looking forward to seeing you at this great event.